Poppies and blueberries reappear in the countryside and in cities. On the motorway edges as well as around industrial sites, they avoid soil erosion and therefore the risk of scree on the road. In addition, they require little maintenance. These wild plants constitute a new market, which seduces more and more … The Phytosem team testifies. “We select species and varieties that are adapted to the region and have not undergone any genetic improvement,” explains Julien Planche, technical director at Phytosem. Phytosem is a French seed company specializing in the production of wild species seeds . The seeds marketed come from propagation plots or are collected from natural sites. Mixtures placed on the market are of interest to local authorities, roadside developers and industrialists. “The idea is to offer durable plant cover perennial” à la carte “, focusing on native and perennial species, says Julien Planche. We harvest wild populations in the Southern Alps and in Provence, in order to maximize their adaptation in sometimes difficult contexts such as roadsides, ditches or retention basins. With the help of about 50 farmers-multipliersthe seed producer produces 15 to 20 tons of wild plant seeds per year. Four species alone account for 80% of the market: rosemary burnet, perennial flax, daisy and lanceolate plantain. But there are also blueberries, poppies or harvest chrysanthemums, which are usually associated with grass grasses. The number of pollinating insects has decreased drastically due to the lack of access to pollen and nectar in quantity and quality. Today, like the “Biodiversity for Bees” network, professionals recommend mixtures of wild flowers that provide a balanced pollen diet to extend the life expectancy of domesticated pollinators, such as bees, or wild. The wild plants selected in the mixtures show staggered blooms. Thus, the larger the range of plants proposed, the greater the number and diversity of pollinators. The craze for wild plant mixtures, which reconcile agricultural interest and society’s environmental expectations, is growing. Many large seed companies have embarked on this niche market … The quality labels (see box below) should make it possible to promote local production, in the face of imports of plants harvested in Eastern Europe. “You still have to be patient,” says Julien Planche. Perennials need time to settle, almost a year! “. Two labels were born between 2012 and 2014 to ensure the quality of mixtures seeds of species wild, especially their origin. 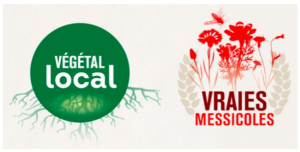 The “local plant” quality sign certifies the local origin of the plants, while the “true messicoles” label is used to honor the flowers that historically accompany cereals, such as poppies and blueberries. In both cases, audit and monitoring systems accompany the adhesion to these labels and a population conservation component is put in place to maintain maximum biodiversity.